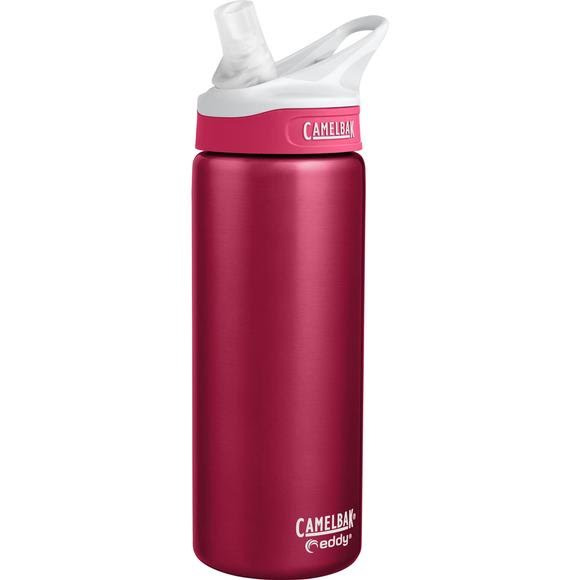 Camelbak's best-selling eddy® bottle now comes in a sleek stainless steel design, with double-walled vacuum insulation that will keep your drink cold for hours. That means you won't have to worry about your ice-cold drink turning scalding hot after a few minutes in the sun. The bite valve flips up with a flick of your thumb, which makes it easy to drink one-handed without tipping the bottle. Camelbak &apos;s best-selling eddy® bottle now comes in a sleek stainless steel design, with double-walled vacuum insulation that will keep your drink cold for hours. That means you won&apos;t have to worry about your ice-cold drink turning scalding hot after a few minutes in the sun. The bite valve flips up with a flick of your thumb, which makes it easy to drink one-handed without tipping the bottle. Pure steel is also naturally BPA-free and won&apos;t add any funky tastes to your drink. Plus, the bottle is easy to carry and cleanâ€”all of the pieces are dishwaser-safe, the loop on the cap lets you transport your water supply in the crook of your finger.